Lime caviar really is the perfect way to describe this fruit. The first time I sampled finger limes I was amazed at how firm the little juice beads actually are. It's only when you crunch down on them in your mouth that they burst and the tangy flavour is released. The texture is quite sensational and the flavour more complex than regular limes. The red champagne cultivar is described as having fruit with spiced apple, apricot and berry aromas. 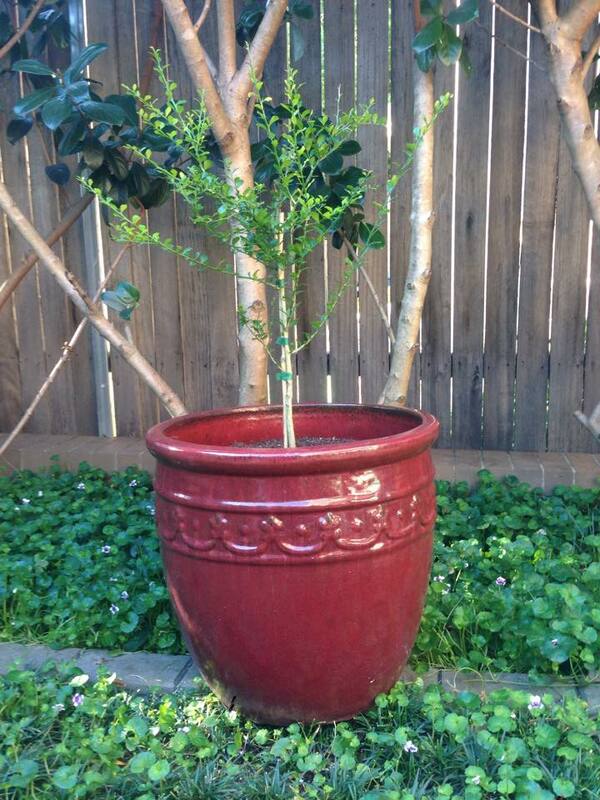 I planted my own finger lime last spring after completing a bush foods workshop in Sydney with Narelle Happ. Mine is a pink variety called Rainforest Pearl and I can't wait to get my first fruit! 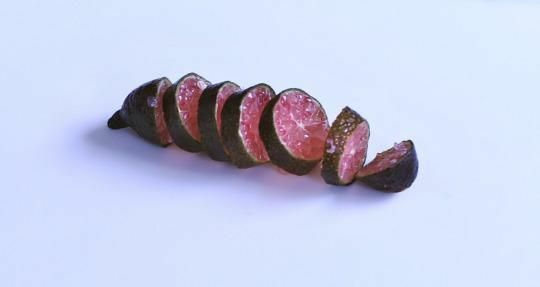 The most well known of Australia's six species of native citrus, finger limes are considered a gourmet bushfood and are sought after by top restaurants around the world. They are a fringe rainforest and understorey species indigenous to the rainforests of south-east Queensland and northern New South Wales. Finger limes are a hardy shrub to small tree and in cultivation plants usually grow around 2 to 5 metres and can be pruned to a manageable height to make them easy to harvest. Leaves are significantly smaller than regular citrus, and they have thorns and slender finger-like fruit from 6 to 12 centimetres long that come in a range of colours including black, green, red, pink, and yellow. Nursery stock are usually grafted onto common citrus rootstock varieties. 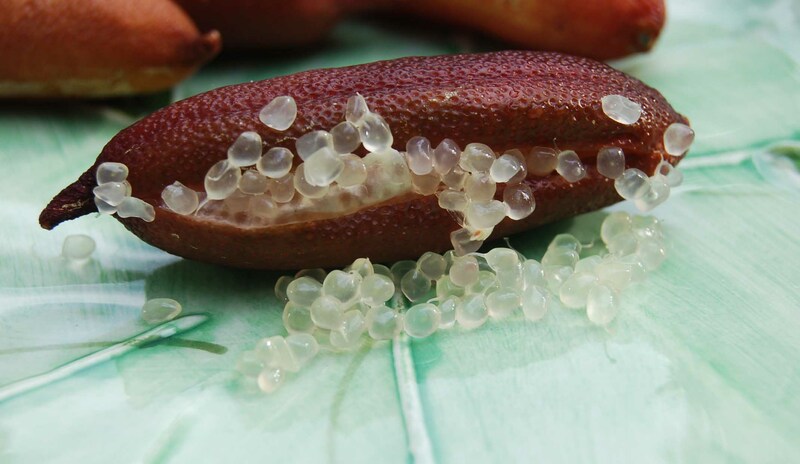 You can grow your finger lime in the ground or in a container and they will perform well as a feature tree, hedge, or even espaliered against a fence. They will tolerate nutrient-poor soil and will require around a quarter of the amount of fertiliser as regular citrus. Apply fertiliser, compost or decomposed animals manure, as well as trace elements in spring. For best results prepare soil with organic matter or buy a quality potting mix. Soil should be well-drained with a pH of between 5 and 6.5. Water containers every 3 to 4 days, and more frequently on hot days. Find a wind protected position for your tree with full-sun to part-shade and shelter your plant from the hot afternoon summer sun. They will tolerate light frosts once they have established but if you live in a cold region, you could try growing it in a container and moving it in response to the weather. To maintain a neat and healthy foliage, regular light pruning is advised and once the plant is established lightly prune after harvesting fruit. Encourage an open shape with around 4 to 6 branches and remove any suckers from the rootstock. Finger limes experience similar pests and diseases as other citrus including aphids, caterpillars, scale insects, bronze orange bugs, mealy bugs and grasshoppers. 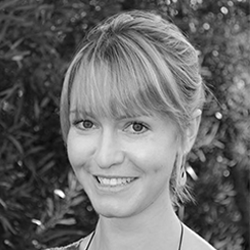 You also need to look out for dark brown spots that could be a fungal disease called melanose. They are also the natural host of the citrus gasp Bruchophahgus fellis and this can be reduce the quality and quantity of the fruit yield as well as the overall health of the tree. It's important to check your trees for galls between June and September, and prune off any infected branches before the adult wasps emerge, which is usually by the end of August. Fruiting occurs between December and May, depending upon the cultivar and the climatic conditions. Grafted plants usually begin fruiting in their third year, and start having larger yields by their sixth year. The horticulturist at the nursery told me I should have some fruit within a year or two of planting my tree. There is some variation between different cultivars with some fruiting multiple times a year, some fruiting annually and others biannually so consider this when selecting your variety. Fruit must be picked when they have fully ripened because they won't ripen off the tree. You'll be able to tell if they are ready to pick because they will feel full and will fall off the branch easily. The skins are more delicate than regular citrus and easily scar so expect some of your crop to have some marks. Avoid picking fruit when they are wet or early in the morning to lower the risk of rind damage from the release of oil from damaged oil glands (oleocellosis). Store picked fruit between 10 and 20 degrees and they should have a shelf life of around 3 weeks. You can use your finger limes with seafood, in salads, drinks, desserts, sauces or marmalades. Fruit can be frozen whole and this is a good way of preserving some for year-round eating. Or the rind can be dried and crushed to be used as a spice. To open, cut the fruit crossways and squeeze out the lime caviar. The oil from the skin can affect the flavour of the pulp, so it's important to avoid getting excess oil from the skin on the pulp. Where can you buy plants? Go to a bush foods or native plant nursery or if there isn't one nearby, talk to your local nursery and see if they will order one in for you. You could also order one from an online nursery.